Ever wonder how it feels like to be hit by 2,500 psi of force from a power washer? Those unfortunate enough to know had to be rushed to ERs for treatment. The extreme force power washers give out is one of many reasons why Nashville pressure washing should be left in expert hands like Pro Wash. If not handled properly, this amount of pressure is more than enough to damage vinyl siding or inflict serious injuries. Pressure washing is designed to remove the toughest clingers on any home or building exterior. A compressor unit provides the pressure necessary for the water and any cleaning solvents to dislodge tough stains. Several of these equipment are available in the market, with pressure capabilities ranging from 500 psi to more than 3,300 psi. A typical garden hose can only produce 40 psi, which is only eight percent of the weakest pressure washer available. One of the cardinal rules of pressure washing is to treat the washer like a loaded gun. Not only can its force damage siding and injure someone in its path, its recoil can also create risks for the user. Due to the immense force of the equipment, Nashville pressure washing services only use it to clean parts of a house or building that can take it. A 3,000 psi washer, for instance, is good for cleaning sidewalks, stairs, concrete patios and decks, solid walls, and pavement. Using it on windows and doors can destroy these installations. 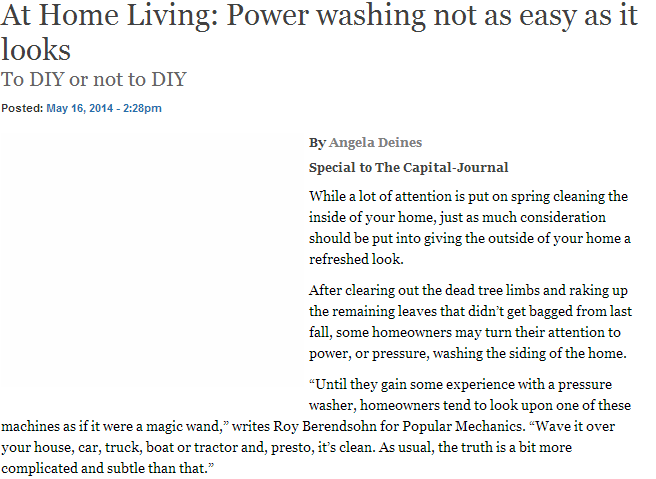 Professionals also wear protective gear, including heavy-duty boots, when power washing. A jet of water to the foot can be excruciatingly painful. While 3,000 psi is the benchmark for professional pressure washing, some services also offer consumer-grade models for light-duty cleaning. The good thing about pressure washers is that many models allow the pressure to be adjusted to suit the user’s washing needs. They can be downplayed to around 1,000 psi for mold cleaning, or upped to 4,000 psi for scraping paint. Regardless of this feature, households should never underestimate the strength of these washers, and rely on the experts instead of doing the job themselves.